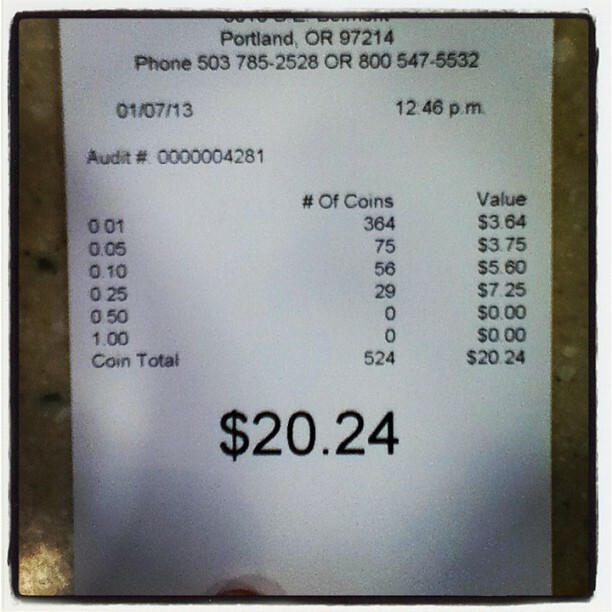 And The “Found Change Challenge” Total for 2012 was . . . 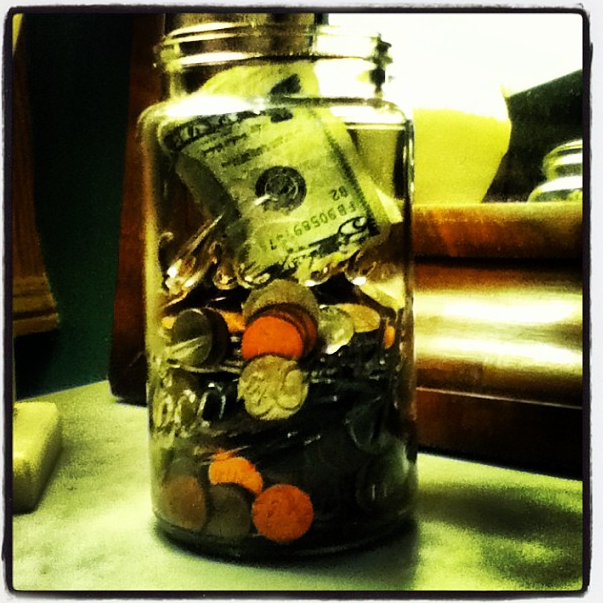 I really enjoyed the Found Change Challenge for 2012, and have already started up a new jar for 2013. For those who are new to the blog, the Found Change Challenge was a year-long project to save up all my picked-it-up-off-the-ground money and then devote it to a single cause in the end. My goal had been to find $65, which would have been enough to stay one night at our favorite beach cabin. I knew that number was lofty, but I am Coin Girl, and if anyone could do it, it would be me. First I picked out the foreign coins and wheat pennies, and of course set the paper money aside. One penny and one quarter would not go through. But the number that I am most loving is that along with75 nickels, 56 dimes, 30 quarters, 3 dollar bills and a single 5 dollar bill, I found exactly 365 pennies. Read that again — I found exactly 365 pennies! I felt weirdly sad and kind of deflated to turn all my hard-won money over to the credit union. It’s been so very satisfying to watch the jar fill up with plucked coins from my travels. (Yes, going to the grocery store falls within my definition of traveling.) Luckily, the next stop in my day-o-chores was to drop a few things at my son’s old middle school. And whattayaknow, I looked down to find two dimes and a penny in a puddle right outside the school. And how will I spend my $28.50? This practical blogger put in into her 17-year-old son’s college account. Yeah, I’m crazy like that. Did you participate in the Found Change Challenge? And if so, how much did you find? Please share your totals and stories in the comments section below. does change you find in your own house/car count? because I am always finding “phanTom pennies” here and there in corners of my house. I didn’t count money from the house, although I do set that aside in a different spot. We use it for bus fare, etc. When I was 9 or 10, I called my mom at work to see if I could go to the pool. She said yes, but I had no money. I collecte enough under sofa cushions,etc. and had some left over for a Popsicle. Fifty some years later I still look under cushions! I remember being walking about 1.5 miles each way to the library, and using my bus fare to get a soda at the Five & Dime (Woolworth’s, I think). That was always a great day – books and a soda!! I am TOTALLY doing this in 2013! It’ll be interesting to see if Midwesterners leave more or less change on the streets than West Coast folks! OK, I am in – we will see how Sydney performs in relation to the US. I only found $2.52 the entire year! My best find ever was a $100.00 bill several years ago on my daily trail walk ! So far in 2013 I haven’t found anything – maybe when (if) the snow melts and I can see the ground again. Look on the ground next to cash registers. That’s where I find 80% of my money. And on the ground outside drive-thru windows. I found 21 cents there one day, when I opened to the door to retrieve a quarter that I dropped. Count me in!!!! I’d LOVE to “find” money this year!!!! Katy, We walk our dog a lot. A LOT. Sonic and school sidewalks are a good spot for change and the infrequent bill. Our total for 2012 was $109.94. I was pretty excited about that in a nerdish way. I bow down to your prowess! My version of the Found Change Challenge involves collecting containers with the NY 5-cent deposit, in addition to hard cash. For 2012, my total was $259.20–and this was an off year, since I had knee surgery last January and wasn’t out on the streets for a couple of months thereafter. It’s usually closer to $300. Cha-ching! I never find wheat pennies anymore! Lucky you! The wheat pennies are rejected by the coin counting machines, so they sit in the reject tray. We save change and found money together, I suppose I could split it up for just such a challenge!! I have only found one penny so far for 2013. Are you making a goal amount again this year? Same as last years? I would like to find $100, but it’s kind of hard to influence the amount found. Haha! I would even be happy with a $20! My hubby is actually much better at finding money than I am. It’s like he should be Coin Man! I’m going to take the found money challenge and put some hard numbers behind my claim! 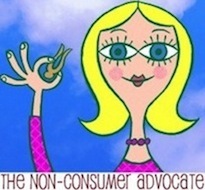 Katy, you averaged about 8 cents a day. You need to get out more like the dog walker. I always seem to drop change at CVS into the gum and candy displays underneath the cash register. Maybe everyone does. I don’t find money like I used to. I think people using plastic instead of cash is part of the reason. Secondly, now a days I don’t walk in places where people are likely to drop money as I did when I was working in a mall. I always volunteered to clean the booths at a restaurant I worked at because there was always money under the cushions. I thought I was the only one who picked up pennies anymore. I will be joining this for sure. I usually just mix it in with all other change. I’m gonna set up a jar and do this 🙂 I think it”ll be kinda fun!